Earn $97.49 in VIP credit (9749 points)What's This? Pioneer developed their dual-leg, 12-point strain gauges with the Belkin race team, and now they're bringing their Tour-tested power meter to Shimano's new 9100 Crankset. Only Pioneer can offer you real-time analysis of your power output as well as pedal stroke. It transmits those data to any ANT+ cycling computer, and pairing it with one of Pioneer's own cycling computers opens up an even wider array of torque vector analysis. The genius of the Pioneer Power Meter System is the dual strain gauges (one for each crank) that measure force vectors every 30° of crank rotation, or in other words, 12 points of measurement for each leg every pedal stroke, with each point recording a force and a direction. The Pioneer system will transmit this data to any ANT+ enabled device, but it really shines when paired up with Pioneer's Touchscreen Cycle-Computer; this information is analyzed and displayed in real-time to show you not only how much power you're putting out but also, by utilizing the vector data, how efficient you're being with your power. After all, putting out 400 watts for 20 minutes certainly sounds impressive, but it might not amount to much if you're applying all that force in any other direction than what is optimal to spin the crank around. This system is paired with Shimano's brand new Dura-Ace 9100 drivetrain. 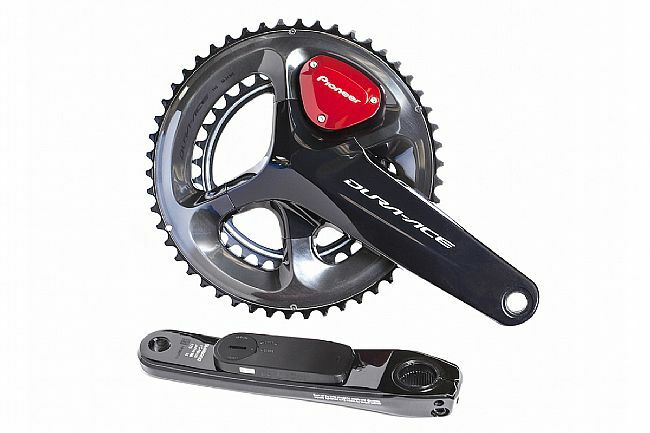 The Shimano Dura Ace FC-R9100 Crankset has a wider arm than the previous 9000 series crank, but this top-level component still manages to shave 7 grams of weight without reducing stiffness. Hollowglide chainrings and a Hollowtech II crank construction make this superb feat possible, and it's ready for today's modern race geometries with a re-positioned inner chainring to improve performance with 135mm rear-spacing frames and short chainstays. I haven't had the meter for very long. However, I've been using power meters for training and racing for 17 years. I needed a power meter for my new Trek Emonda with a BB90 - choices were limited so decided on the pioneer. Set up was easy - best advice is to watch the Pioneer YouTube video on how to set up a ANT meter with the Pioneer dual leg power meter. Pairing and calibration to my Garmin 520 was very easy following the instructions in the YouTube video. The down side (why I give it four stars) is you must use the pioneer supplied magnets for cadence and have to stick them on the frame. Most other power meters have accelerometers so there is no need for magnets - my biggest complaint. The Pioneer Power Crank (Shimano 9100 with strain gauges and pioneer electronics installed) is not much heavier than the stock 9100 crank. Pairs nicely with the Garmin 520 so no learning curve with a new head etc.. You need 2 type 2032 batteries for each side of the crank. So far the meter seems accurate and is within accuracy of my Quarq and power2max meters. I prefer Quarq but they don't have a BB90 that would fit my Emonda. The Pioneer is a good alternative.